Senator Robert M.T. 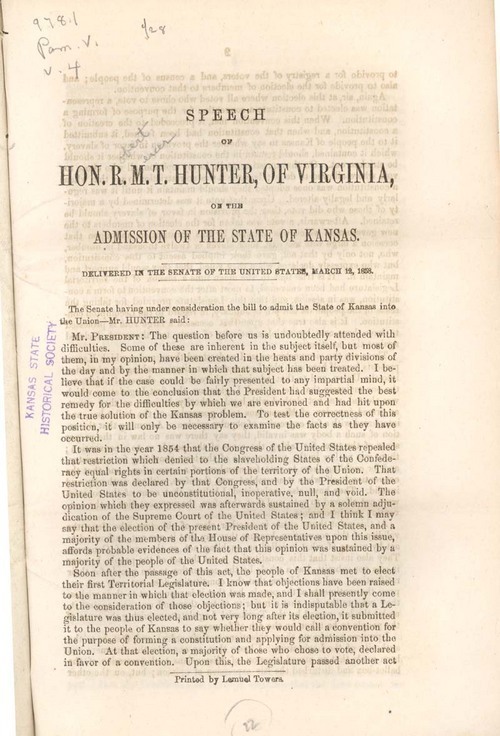 Hunter delivered this speech on the floor of the Senate in support of adopting Kansas into statehood under the Lecompton Constitution. Hunter argued that the Lecompton Constitutional Convention had been formed under the consent and election of the people of Kansas, not as an instrument of the Territorial Government. He also stated that those accused of being "foreign" Missouri voters were nothing more than settlers who had staked their claims in the fall of 1857 and left them to return the following spring. Hunter added that it would have been impossible to ascertain the true will of the people if the entire Lecompton Constitution would have been put to a vote, as it would be unlikely that voters would approve or disapprove of every single provision it might include. Ultimately, Hunter believed that "white men should have the continent, not as equals of the Indians or the negros, but as their masters." Creator: Hunter, Robert M. T.